NETWORK FINALS: SWAT gained 0.1 in final numbers. In addition, THURSDAY NIGHT FOOTBALL adjusted to 6.4. CABLE HIGHLIGHTS: Note that due to Thanksgiving, all comparisons except where otherwise noted are to 2 weeks ago. NFL Network’s share of THURSDAY NIGHT FOOTBALL was at 1.10, up 0.13 from November 15. On MTV, JERSEY SHORE dipped 0.04 to 0.66, and FLORIBAMA SHORE was at 0.41/0.31. TNT’s NBA doubleheader was at 0.44/0.36. A&E’s LIVE PD: PD CAM was at 0.30/0.28, compared to Thanksgiving’s 0.23, and POLICE PATROL was at 0.25/0.21 compared to the 0.22/0.21 from 2 weeks ago. Food Network’s BEAT BOBBY FLAY jumped 0.11 from its Thanksgiving Night airing to 0.25. MSNBC’s RACHEL MADDOW SHOW led cable news (ranked #8 in all cable) at 0.36/0.52/3.4M, with CNN’s ANDERSON COOPER 360 at 0.21/0.29/1.4M, and Fox News’s TUCKER CARLSON TONIGHT at 0.20/0.38/2.6M. Adult Swim’s TENDER TOUCHES was at 0.31/0.28. Univision’s LIGA matches were at 0.29/0.27. 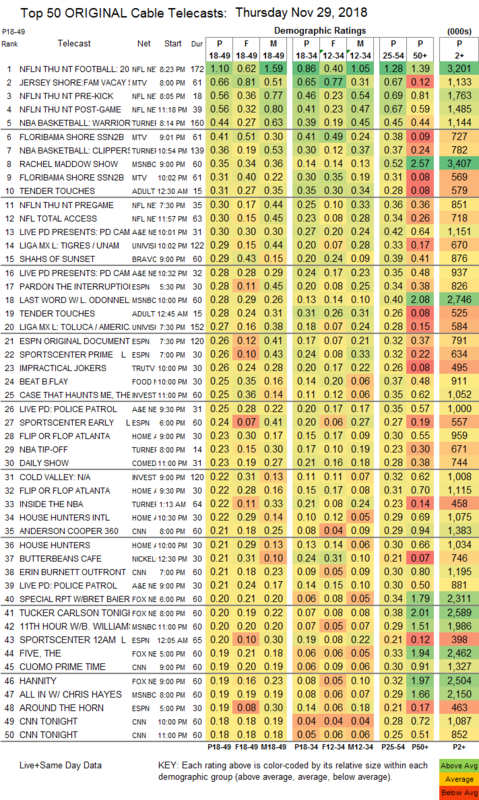 Bravo’s SHAHS OF SUNSET edged up 0.02 to 0.29. An ESPN documentary THE LAST DAYS OF BOBBY KNIGHT was at 0.26. 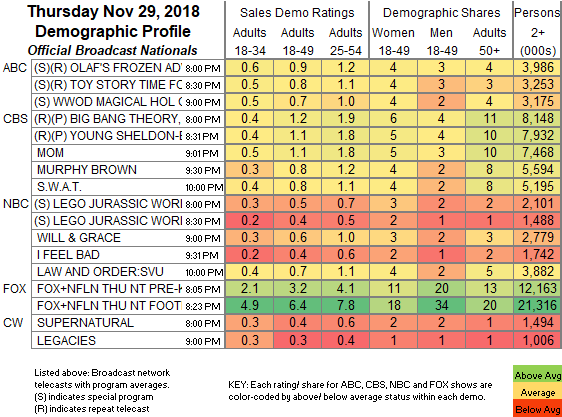 Tru’s IMPRACTICAL JOKERS slipped 0.02 to 0.26, and the AFTER PARTY was down 0.02 to 0.16. On ID, THE CASE THAT HAUNTS ME rose 0.04 to 0.25, and COLD VALLEY was at 0.21. On HGTV, FLIP OR FLOP gained 0.02 to 0.23, HOUSE HUNTERS climbed 0.03 to 0.22, and HOUSE HUNTERS ticked up to 0.21. We’s GROWING UP HIP-HOP ticked down to 0.16. POP’s IMPACT WRESTLING was at 0.03/122K.